A French Bulldog’s hair is shiny, smooth, fine, and short. But just like any other furry friend, they also shed. Dogs normally shed hair to get rid of extra or damaged hair and to cool down during summer months. However, if you notice that your Frenchie is shedding more hair than usual, they might be suffering from a skin condition. Why Is My French Bulldog Losing Hair? Food irritants – know what you are feeding your dog all the time and avoid foods that may cause allergies. Environmental irritants – pollens and other airborne irritants can cause skin conditions for Frenchies. 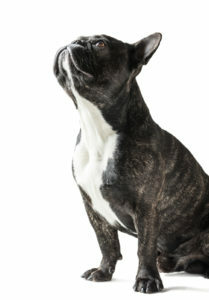 Hot spot or acute moist dermatitis – a condition that is common to all canines but especially Frenchies who develop moisture in their skin folds. Chronic dry skin – caused by too much bathing. Dandruff – hair dandruff caused by allergens inside your house. Mites – mites burrowed into a French Bulldog’s hair can lead to excessive hair loss and even bald spots. Because of the folds in their skin especially on the lower jaw, French Bulldogs also develop lip-fold pyoderma, a bacteria, and yeast infection due to the constant moistness in the folded area. A severe lip-fold pyoderma can cause their skin to redden and it can spread and lead to hair loss. Hair loss prevention or reduction is usually a more likely solution than finding a cure – especially if your Frenchie’s issues are allergy related. To reduce the chance of hair loss on your French Bulldog, give your furry friend these three things – routine care, good diet, and enough exercise. Routine care – Treat your Frenchie like your own child. Be sure to brush their hair regularly, check their wrinkles for moisture or yeast infections, and keep them away from typical food or environmental irritants as much as possible. Good diet – Feed your French Bulldog a lean diet which is free from typical food irritants that cause allergies. Also, keep an eye out for food scraps and other items around the house to stop your Frenchie from eating something they shouldn’t. Exercise – French Bulldogs don’t need much exercise but take them for a walk at least once a day to keep them fit, healthy, and stimulated. Most importantly, be mindful of your Frenchie’s behavior. If they are acting strange and scratching their skin constantly, check with your veterinarian. There is no need to wait for your dog to start having hot spots and dry patches before visiting a veterinarian. If you think your French Bulldog is shedding more hair than usual and has been vigorously scratching, start checking for possible causes. Always begin with your pet’s diet. If you are not feeding it anything out of the ordinary, check the environment your pup is playing in. If you haven’t changed its diet or exposed it to any nasty environmental irritants, visit your vet immediately. Will is the proud co-owner of Frankie, a Female Brindle French Bulldog, with his wife Michelle. We share our Frenchie experiences with the world to help health-conscious French Bulldog owners who want a happy, healthy, and long-living dog. Why are French Bulldogs so expensive? Copyright 2018 Sidekick Digital. All rights reserved. Disclaimer: Ask Frankie is a participant in the Amazon Services LLC Associates Program, an affiliate advertising program designed to provide a means for sites to earn advertising fees by advertising and linking to amazon.com. Exclusive offers and reviews on products that will make your Frenchie the happiest Bat Pig in the neighbourhood!